Dreaming of freshly shucked oysters off the rocks, swimming with turtles, sipping fine wine and sampling fine cheeses overlooking the turquoise ocean and bay at sunset? What about camping next to a lighthouse under the stars, awake to a superb sunrise over the ocean? Get bored? Good rock climbing on granite cliffs awaits you. There's something for everyone! There are several methods to see Cape Cleveland. You could go with your mates on a private vessel, via commercial ferry, can bushwalk out there. 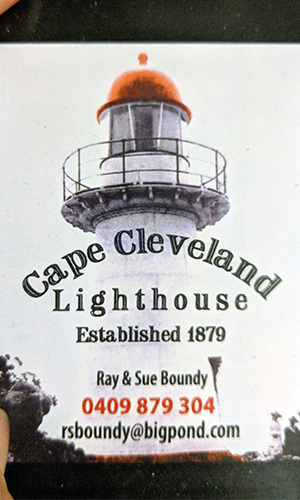 To go to the lighthouse (which is private land), you will book a ferry with Ray Boundy who currently has the lease on the lighthouse out there. The barge costs $30 and camp site fee. The bonus is, hiking in you only need to carry a light day pack whilst enjoying a nice coastal walk. Overnight gear can go over on the barge. This will need to be dropped off at the barge owners place. Therefore for the hike in and out you only need day pack, with food and water for the day (no water resupply during the hike in or out). There are rain water tanks at the cape camp site and water sterilisation tablets are recommended. Other basic facilities are also available at the cape (toilet, shower, BBQ). You can either hike along the ocean coast from Sunset Beach near Cape Woora, or along Cleveland Bay starting from near Cocoa Creek. Both routes involve bush bashing all day cross country. If using Cleveland Bay route, timings are subject to tides. This journey goes through beautiful scenery, along the beach and over the mountain ridge - which is similar to a scene in Lord of the Rings with rolling grassy hills and stone features protruding. Park your car off to the right before you get to AIMS. Walk along Cape Cleveland Road until you get to AIMS. From here you will need to bushwalk around the left side of the private property following the fence line through head-high guinea grass - best done after a burnoff. Once you get to the ridgeline between the two bays, take a left into the next bay. If you are keen and it's low tide, you could take a side route continuing straight out past the rocks to the ocean and follow the coast around to the beach and walk out to Cape Ferguson. The section between low and high tide is no man's land. Follow the trees tagged with tape over to Paradise Bay. Now you have two options: Either climb up to the ridgeline and follow that out to the cape via Castle Rock or take the inland route going over the saddle into Long Beach. The views of the valley walls are spectacular from Castle Rock and the ocean breeze on a hot day is very welcomed. At the northern side of Long Beach is the remains of an old telegraph track. Follow the telegraph poles along past Red Rock Bay and along the old overgrown track out to the lighthouse. You can make out parts of the track that have been concreted. Either park your car in amongst the mangroves or take your vehicle out along the 4WD track besides Launs Beach. Walk north, going around to White Rock Bay and then on to Long Beach. At the end of Long Beach is where the old telegraph track starts. Follow the telegraph track to the lighthouse. First Aid Kit and PLB. Maps, compass & or GPS for navigation. Your personal overnight gear goes over on the Barge. You have to be self-sufficient. You have to include your personal tent and sleep gear, food, drinks (esky optional), swim / snorkel gear, spare clothes, tripod (optional). I recommend going out on a long weekend so you can have a day of local exploring, visit the coastal cliffs for some rock climbing, swimming at Pebble Beach and oyster shucking on the Cape Cleveland Beach. The oysters on the rocks are natural; you just need to collect them so take a shucking knife. You can also do a beach cleanup, removing all the washed up plastics. Have an afternoon nap or swim. Walk around the cape - the old rail line at the cape was once used to unload fuel from ships for lighthouse. And apparently there are old WW2 gun emplacements out on the eastern cliffs. 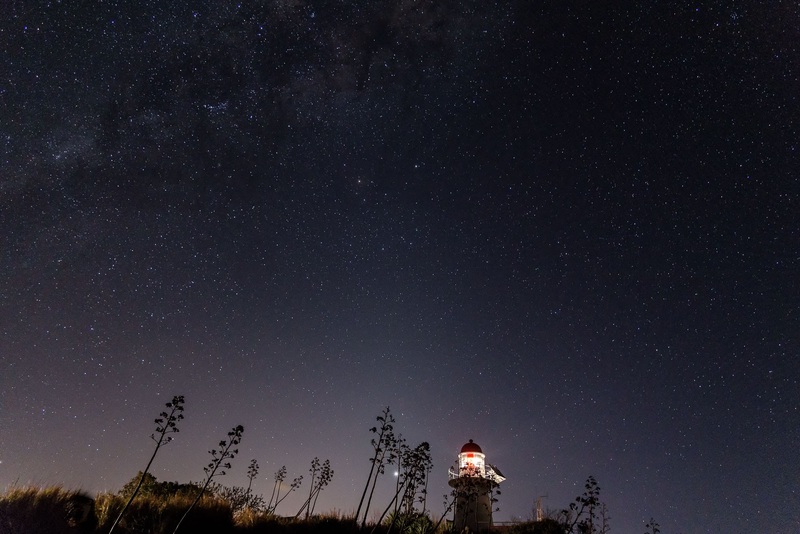 Bring your camera along and take photos of the Townsville's waterfront, sunset and night sky. There is a museum of the modern history of the property where you can enjoy historical displays of the past and present residents. This excellent walk is best done over a long weekend. The route in is good, albeit overgrown with tall guinea grass. The track marked by the Townsville Bushwalking Club in 2014 is reasonably clear in the forested parts, but in the flat country just behind the dunes is overgrown and hard to follow. Despite that, it is roughly 1-2 hours from Cape Woora to Paradise Beach. Hiking is fair dinkum bushwalking - cross country with no formed tracks until near the last hour near the cape, the old telegraph track. There are some low hills to traverse, open woodland, long grass, rocky ground and some sandy beaches. There is no shade along the routes so need good hat and sun protection (the reward is at the cape, an icy cold refreshing ale may await you - if you put it on the barge). Save this walk for the cooler months, do not attempt this walk in summer. Do not swim in the ocean in stinger season which generally runs from November through to May. Take plenty of drinking water.